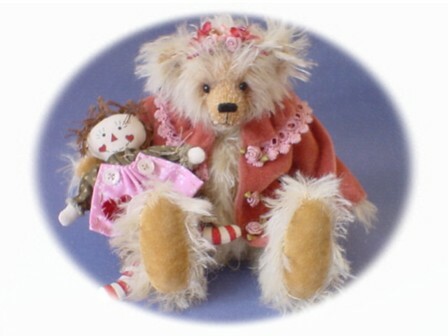 Becky ( the bear ) is one of my larger bears, she stands at 8 inches high...... made from a lovely whispy blonde mohair, she has flowers and beads in her hair that match her coat. Sue ( the ragdoll made by me ) is 4 1/2 inches high she is a sweetie ! I really enjoyed making her : ) her face and legs are hand painted .